Ahoy from the Firth o’ Forth! 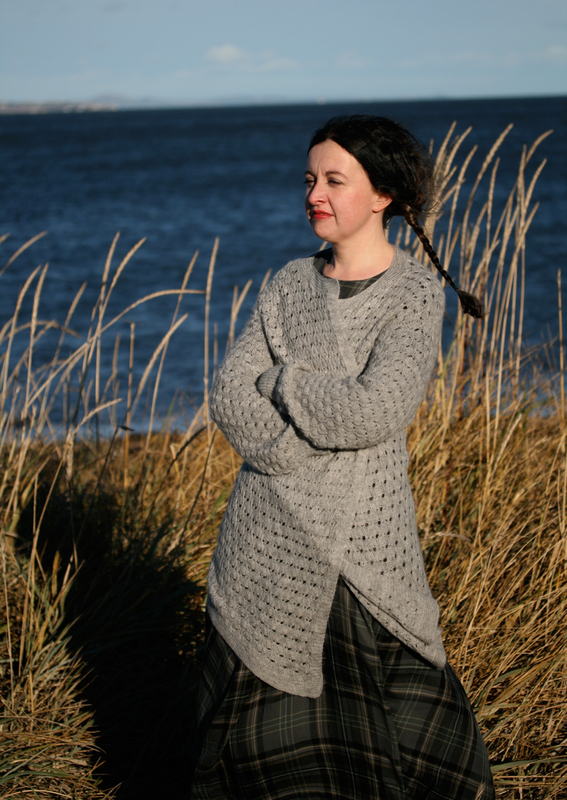 This cardigan is the second in my series of my Edinburgh-inspired designs, and it is named after the important estuary that marks the city’s northern boundary. The Firth was a major feature of the decade we spent in Edinburgh: we lived in sight of it – just up the road from the fishing village of Newhaven – and its mists and breezes very much defined our weather. I think that one of the great things (of the many great things) about Edinburgh is that it is a city with a shoreline: as well as hills, and closes, and castles it is a place of beaches and seabirds and Sunday strolling. We spent many happy weekends on foot around the Firth, and, from Cramond in the West through to North Berwick in the East, it is a stretch of coast I know very well indeed. I find the North-Easterly prospect of the Firth lends the light a very distinctive quality and, at all seasons of the year, it is a wonderful place to be. This design was inspired by the creature for which the Firth was once world-renowned: the oyster. Firth o’ Forth oysters were, in fact, Edinburgh’s original street food – and in the booklet I’ve produced to accompany the design, you can find out more about their history. This very oyster-y stitch pattern is one I’ve had a thing about for many years – it appears in Martha Waterman’s shawl book under the name of ‘Cocoon Stitch,’ and I knit myself this stole using it back in 2007. Like many of my favourite openwork patterns, it is a relatively simple stitch to memorise (‘action’ occurs only on two out of twelve rows) and yet its effect is quite dramatic. 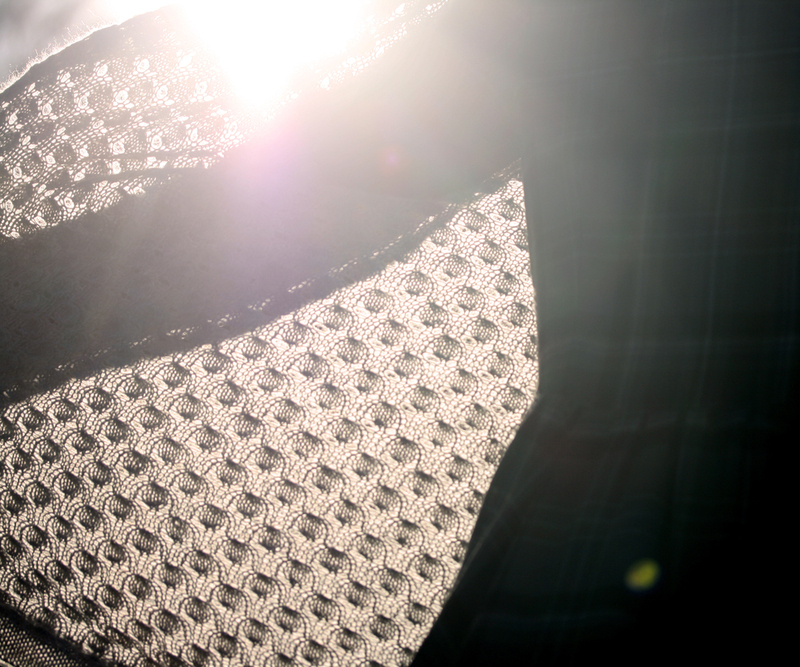 It creates a textured, structured fabric, yet, because of the yarnovers, it also feels wonderfully light and airy. I suppose some people may find it odd to create a cardigan inspired by a bivalve, but to me this is not odd at all. The yarn I used is Yomper laceweight – this is spun by John Arbon for Great British Yarns ‘Union’ range, and is a blend of 70% Falkland Islands Merino and 30% UK alpaca. It has an incredibly light and luxurious hand. While the majority-wool content gives it a pleasing spring and creamy-coloured undertones, the grey alpaca lends the yarn strength and smoothness and a mercurial silvery sheen. All I can say is that from the first moment I felt it in the skein I just wanted to wrap myself up in it. My thinking behind this design was to create a sort of cardigan-equivalent of a shawl or wrap . . .
. . . therefore the garment construction and shaping are relatively simple. 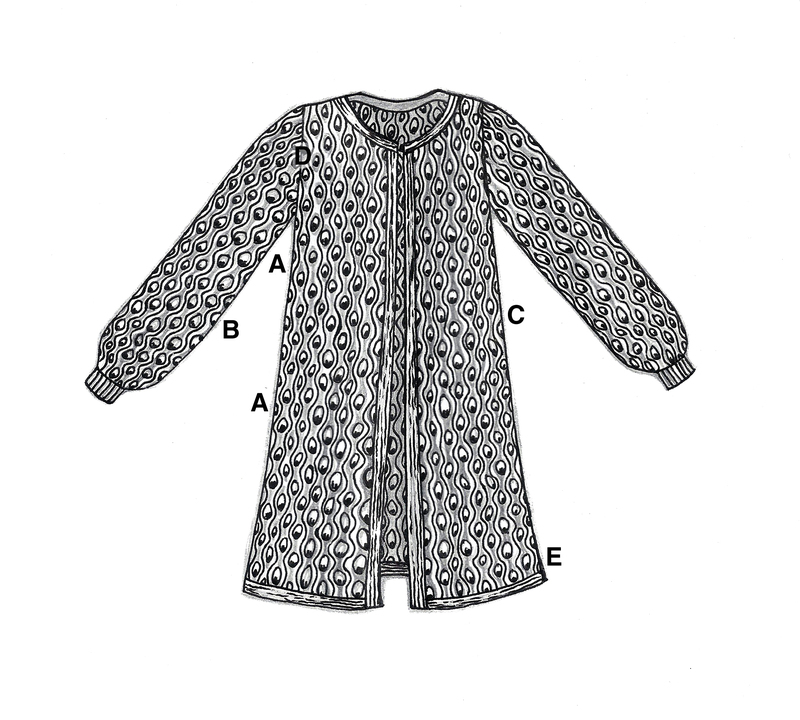 The cardigan is worked back and forth, all in one piece to the underarms, then divided for fronts and back. A little shaping is worked around the neckline; the shoulders are joined and then sleeves are picked up and worked in the round down to the cuffs. There are no seams. Mel (who always has a knitterly trick to add to my designs) came up with the nifty idea of working the sleeves inside-out, which minimises purling. 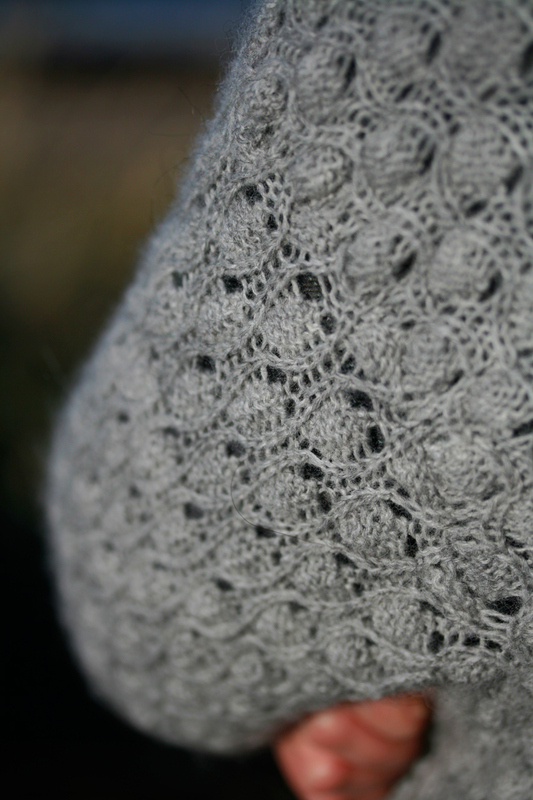 If you like knitting lace, you’ll enjoy making this garment. The fronts can be worn open . . .
Or drawn about the body. And in all ways, this is a garment that is very easy-to-wear. There’s a perhaps surprising amount of ease factored into this garment: I’m modelling it here with 7 ins positive ease, and I don’t recommend making it with less than 4 ins ease.
. . . because it is meant to be loose and drapey and cosy and shawl-like. These photographs were taken down by the Firth at Cramond on a very windy day. But I was surprisingly warm in my Fith o’ Forth cardigan. 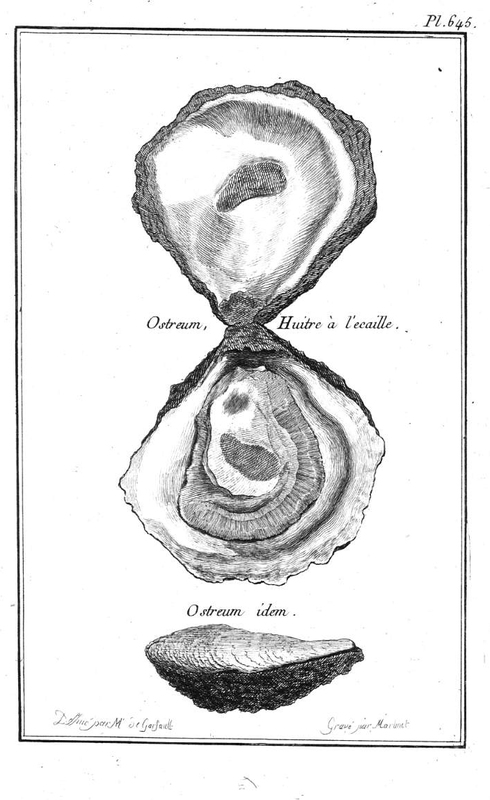 The design booklet includes a short essay (exploring the history of the Edinburgh oyster and the Firth), pattern, charts & schematics, photographic lookbook, and the best eighteenth-century poem about oysters you will ever read. 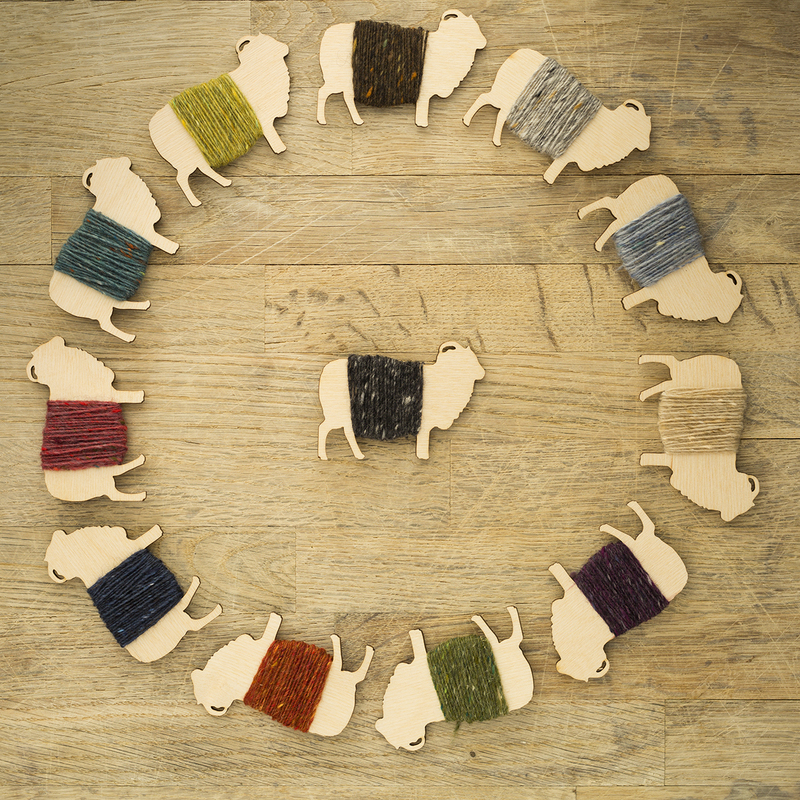 The design booklet is now available digitally via Ravelry, and in print from my Magcloud store. This is truly the Ooooh-my Sweater Pattern I have been looking for years. I just downloaded it. It gives me incentive to hurry up and finish a couple of things here; and then onward! It is just beautiful, filled with grace. I can’t wait to get started on it. God, you look like Jane Eyre ! What a beautiful sunny day ! Scotland is gorgeous. Magnifique ! Je n’ai pas résisté, il est déjà sur mes aiguilles. 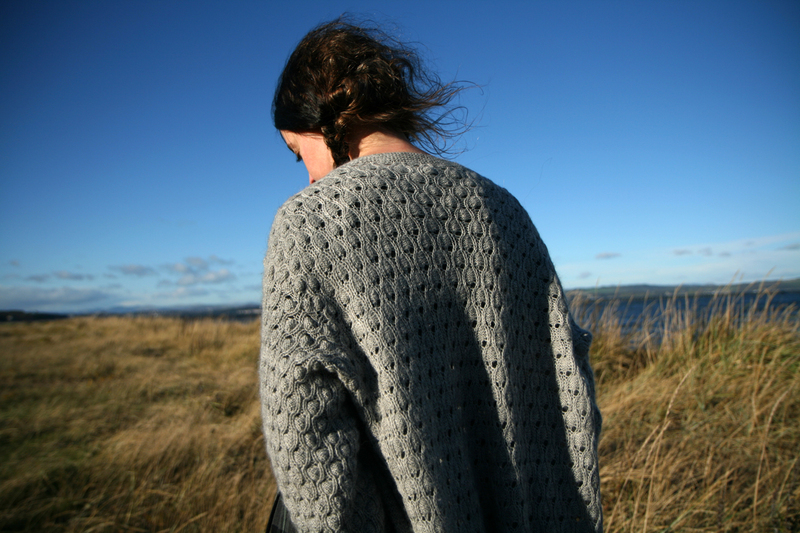 I love this sweater for many reasons, one being that my daughter is at University of Edinburgh and (on a clear day) can see the Firth of Forth from her kitchen window! She also just sent me a birthday gift — some hand-dyed lace-weight yarn from Scotland! I think this would be the perfect project for it, though I may not have quite enough for this sweater as written, but with some modifications — perhaps just a wee bit shorter and with a shorter sleeve — I can make it work. I think it must be! Lovely pictures ! 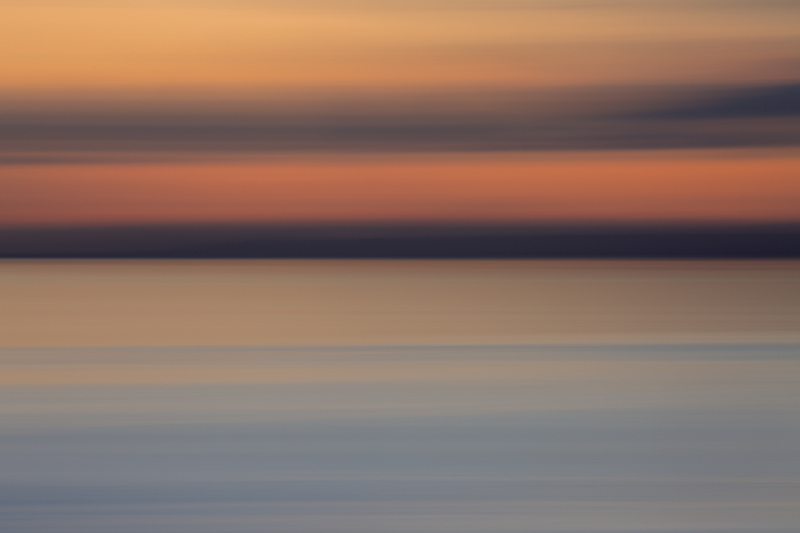 The first one really looks like a painting. I agree – the cardigan is a great pattern, and I, too, love the dress. The bonus is that it is also related to the oyster, my favourite bivalve by far. 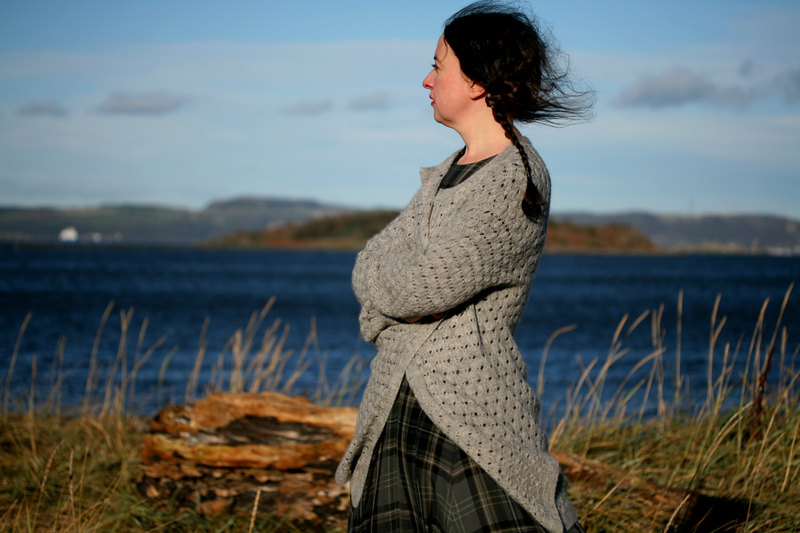 Even if I didn’t want to knit the cardigan, I’d probably buy the pattern for your history of this Scottish oyster. If anyone is interested in oysters & history, I’d highly recommend The Big Oyster by Mark Kurlansky. It gives the early history of New York City through its oysters and oyster production. I just wanted to thank you for all that you do, your designs, historical work, photo essays all are of such value to me. The majority of my ancestors are from Yorkshire and Scotland and as I am completing my family history I am realizing just how many were involved in the textile industries for generations and how many lived near (by Canadian Standards!) where you do now. 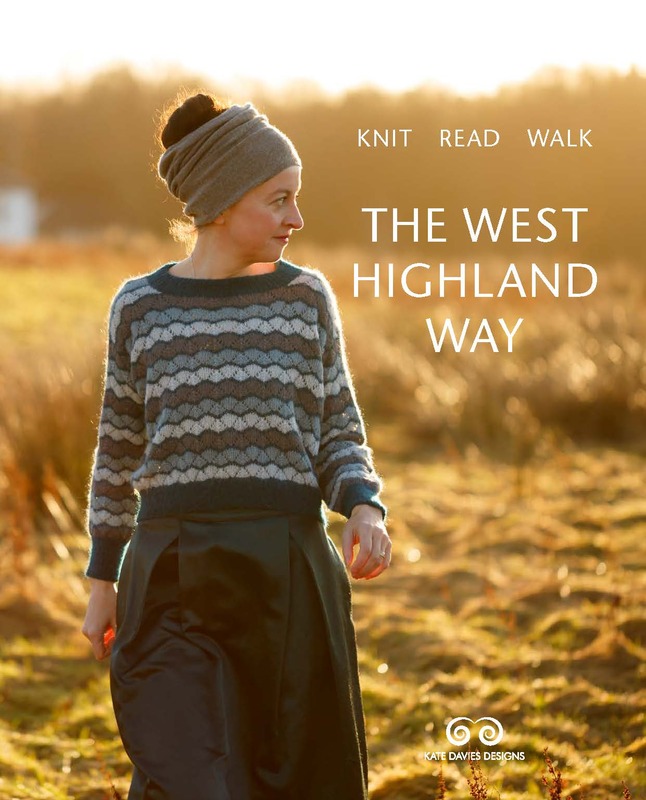 My knitting and spinning brings me closer to those men, women, and children that toiled away to ensure my existence and I can just imagine them walking those beautiful hills and valleys that you so lovingly share with the rest of us. Thank you! and Bruce! I almost left him out. He is a fine looking fellow and I enjoy hearing his updates too! Clever sweater and cute dress. You always make me fall in love with you patterns and the stunning pictures!!! Thank you for sharing all this with us. Your choice of clothing is adorable, after the beautiful set which you wore in the Catkin Shoots, this dress is just beautiful!!!! What a beautifully romantic design. And your dress is perfect with it. How refreshing to see a long cosy wrap sweater after years of skimpy, negative ease garments that make the wearer look like an adolescent who grew 2 sizes and 6 inches overnight. Wow! And then everything everyone else has already said. 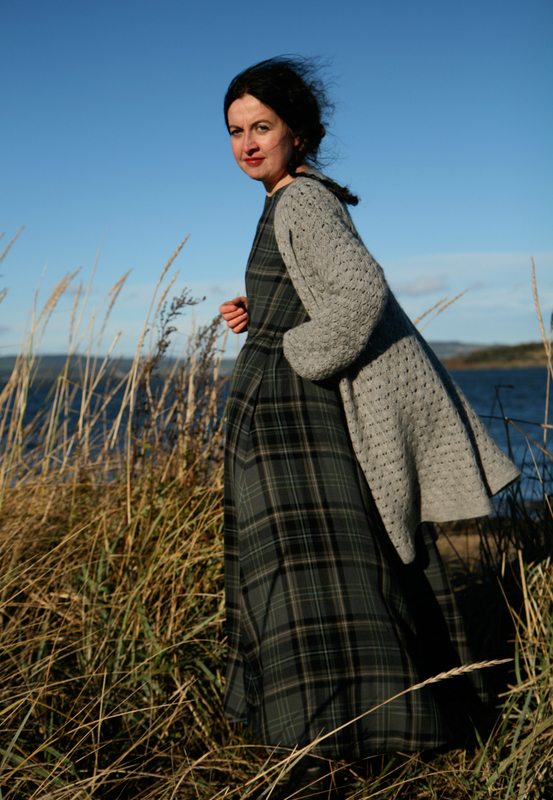 Lovely cardi but it’s completely outshone by you in that fabulous dress in that amazing setting! Have you read Consider the Oyster by M.F.K. Fisher? A fabulous book. John Updike called her “Our poet of the appetites”. Love this cardigan! beautiful. Bought the pattern and preorder the yarn now I will have to wait! Oh my, that is just gorgeous! 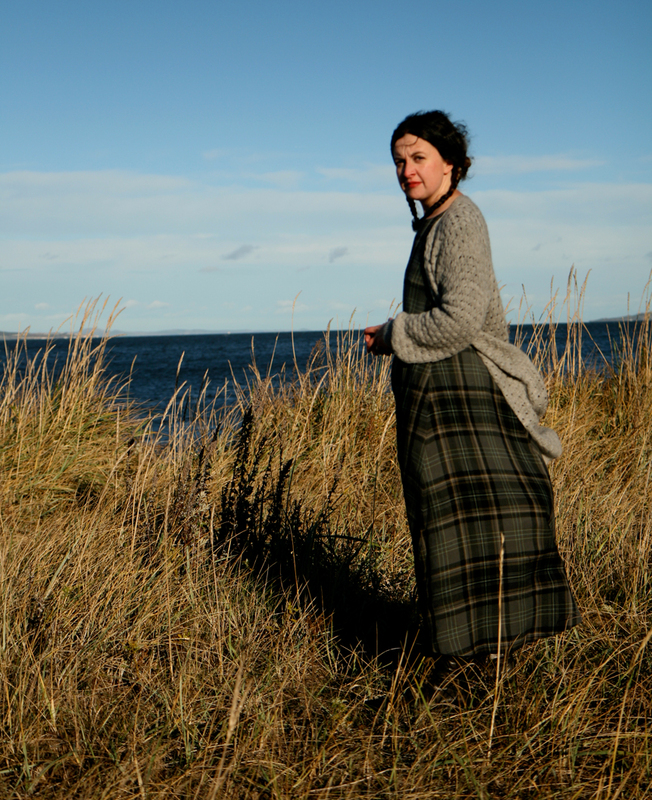 Love the photoshoot, too, plaits streaming out behind you, tartan dress…very evocative. Simply stunning, all round! Kate, It is beautiful and so are you wearing this garment. I have been admiring the stitch on the page header. Looks fresh. I will have to wait until after holidays to begin. Your dress is just beautiful!!!! Where did you get it!!! Just beautiful – the design, execution, and the photographs. Well done! Wonderful and wearable design! It would definitely be welcome on the coast of northern California. 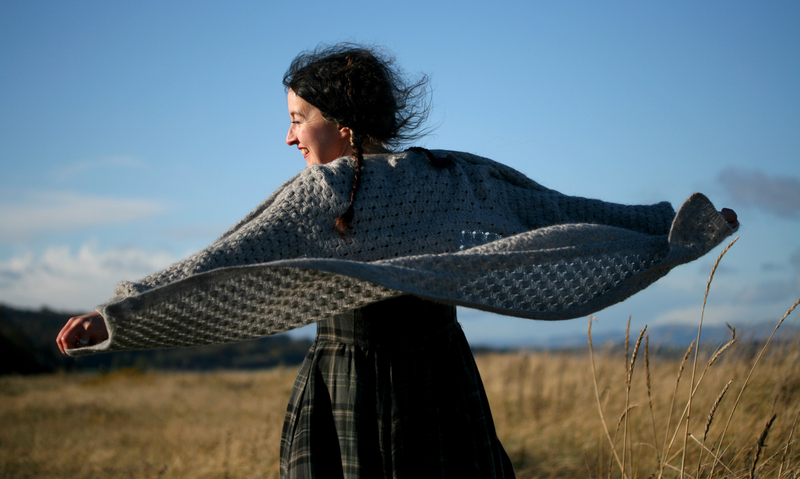 love love love this cardi-shawl, I want to move to Scotland and wear your most wonderful DRESS. May I say “what they said”? The other commenters have already covered every thought that popped into my head as I read your post and looked at the photos. I was mightily motivated, and hopped over to buy a print copy of the patttern. My question is about the dress you’re wearing in your profile photo. I adore it. Did you make it or buy it? If you made it, is there a pattern available? If you bought it, would you share the name of the shop it came from? Thank you, thank you. Know that I eagerly await your posts, and read them greedily (generally re-reading them in a less voracious manner, after the first read). Damn Kate, that is a mighty fine cardigan!!! Might have to bump that one right to the top of my queue. 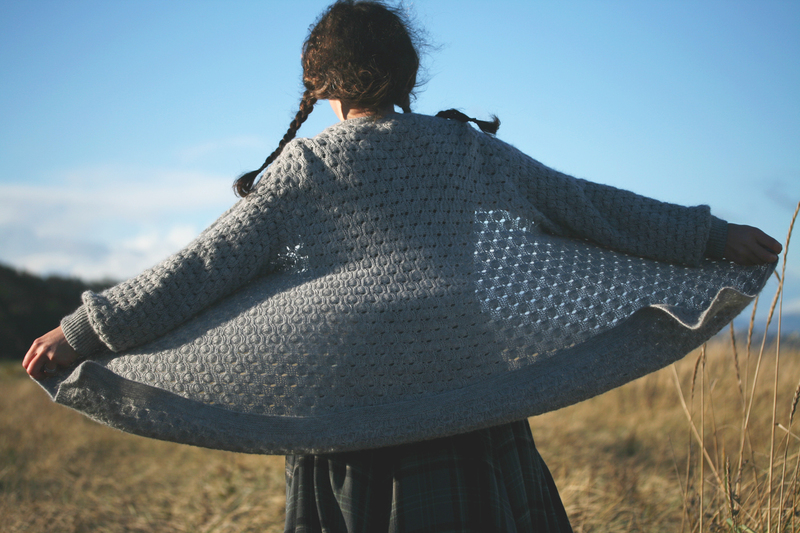 It reminds me of a much loved machine knit bedjacket I wear all year round, naturally it’s much nicer. That’s beautiful, interesting that oysters were popular in Edinburgh, I’d known about them being London street food (along with watercress). Have you read the story in Sketches by Boz about the respectable man who falls in love with a girl in an oyster shop? Beautiful design and beautiful photo up at the top there. Firth o Forth has a lot of meaning for me, my Hunter family moved from Scotland to Jarrow so that the menfolk could work building it, hence my Gt-Grandfather was the only English born in the family! I really really love this Kate! I’ve got the pattern (love the oyster poem) but now I’m trying to resist ordering the yarn! It looks so lovely. Kate, How beautiful you are in these photos! I love the long dress, and your absolute joy is so evident! This is what I call being One with the Universe! 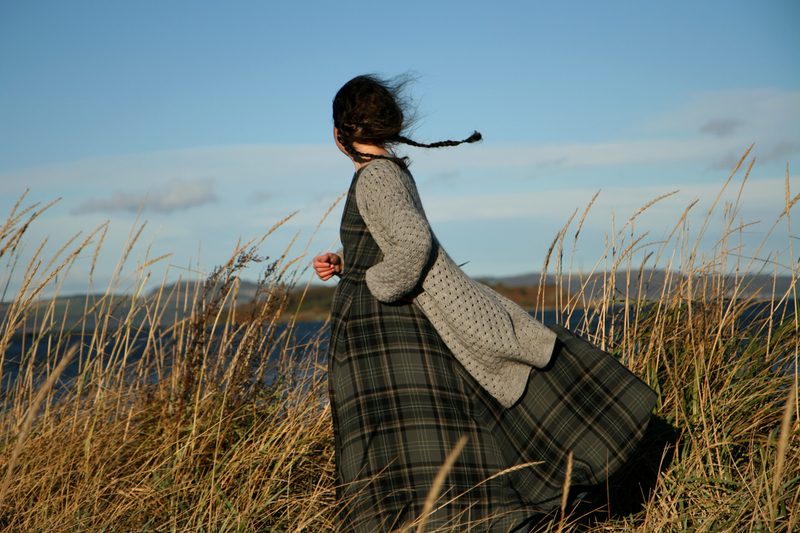 So lovely and reminds me of Jane Eyre on the moors. Love it. Absolutely gorgeous! Another of your fabulous designs to add to my queue. Wow!!! I will knit it for sure!!!!! I kind of wish I already had it on, because it will probably take me 100 hours to make. 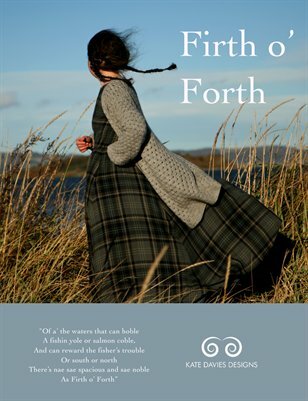 However—yes, I’m going to purchase your Firth o’ Forth pattern in hopes of joining the crowd who loves you! That sweater/coat/shawl is just wonderful, esp with that dress! I really appreciate your following nature in your designs. 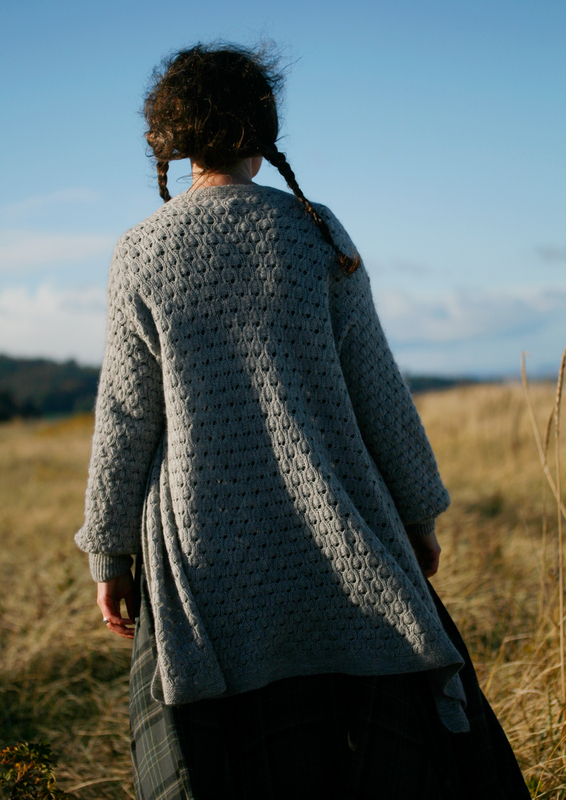 On another note have you ever seen Alice Starmore’s sweater named Fern from her Stillwater collection? Mine is almost done and NO I will not admit to how long ago I started it! It looks fabulous …… I am seriously tempted to knit it …… I may just have to buy the pattern NOW!! A wonderful lacy sweater with lots of texture and drape. What a gorgeous design! A lovely sweater and it looks so cozy! Beautiful scenery and photographs, too. I want the dress too but I’m suspecting it is vintage Cabbages and Roses, am I right? I love Martha Waterman’s book and refer to it all the time! And of course, I’ve admired the cocoon stitch and even thought about doing something with it. Bravo! A fun and lovely design. OOOOOHHH so gorgeous. just what i want to knit and wear… i can see making a few – black and a deep red. cant wait to start . lovely lovely and that gorgeous dress! 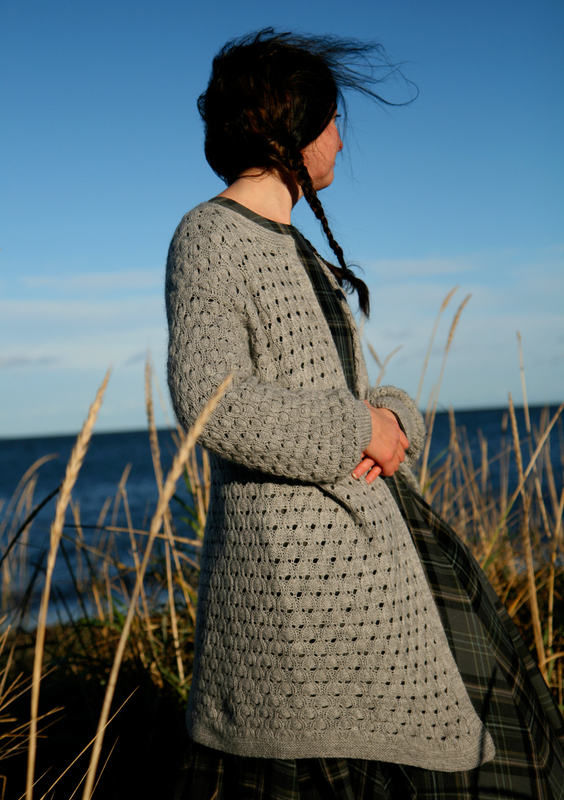 I was driving into work in Edinburgh today along the coastal route from North Berwick, wondering what my next knitting project would be, having I just attached the buttons on me Deco cardigan last weekend. Now I know! I really love all the research you do which inspires your design. I love your sweater! I also like your dress and would love to know where or the name of the store where one could be ordered. I presume it is also a warm woolen! Love it & the dress you are wearing. Where did you get it? I was (only the other day) remarking on my ‘huge Kate Davis habit’ to the yarn shop lady. This looks far too cozy not to knit. And my former cosy (shop bought in a freezing office emergency situation) cardi is now very ratty and not fit to be seen out in….hmmmm…. I was born over the other side of the Forth in Fife many, many years ago but my parents then moved south. I’m always pleased to see your lovely photos of the area and reminisce! 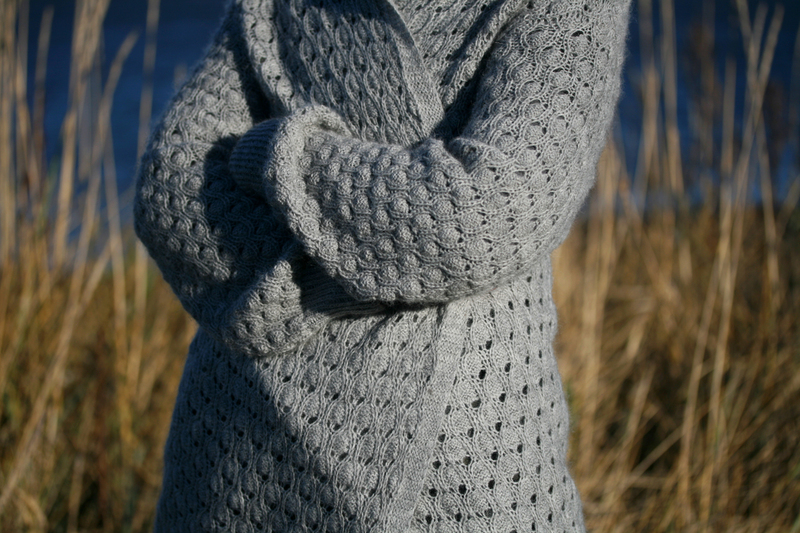 Love the lacy pattern cardigan, cosy against those easterlies!! 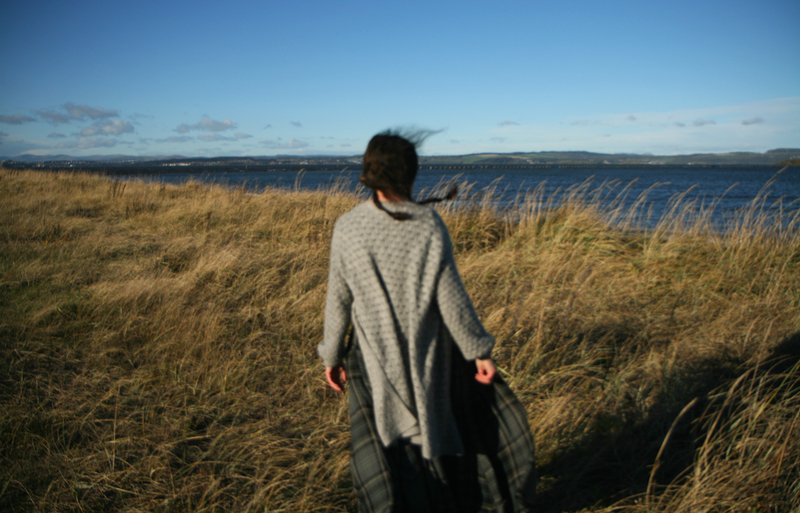 I’m not sure which I like better….the lovely cardigan or the story my mums homeland! Thanks for both. Beautiful clever design Kate, love the tartan dress may I ask where it came from ? The cardigan is amazing! I can really feel how warm and cozy it is. Hmmm, so cozy and elegant at the same time. Beautiful design! Beautiful, fun, unique…….what a wonderful thing to wake up to along with our first snow here in New England! Lovely! Is that really laceweight yarn? It looks more substantial, but light. I visited Edinburgh back in 1991 for a conference and loved the city. I stayed in a dorm room and walked up the mount close by for a wonderful view.